The Dales Tales Poetry Anthology is out now! I’ve been working hard on the Dales Tales poetry anthology – putting the poems together and editing them, working on the artwork, layout and the graphic design. 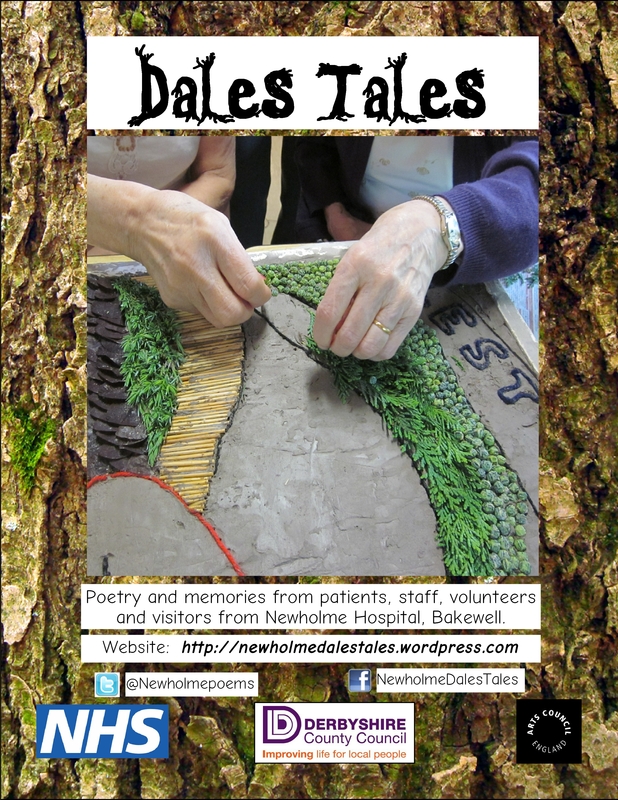 It’s been hard work, but lots of fun, and now I’m looking forward to the launch at the hospital next week, on Tuesday 29th July at Newholme Hospital, where I’ll find out what the patients, staff and volunteers at Newholme think about their words being in print. 300 copies of the anthology are being printed out, which will be given out to the patients and staff who’ve contributed to the project, and they’ll also be distributed to key locations in the local community. I’ll be running workshops in other hospitals around Derbyshire in the autumn, based on the anthologies, and patients and staff in those hospitals will also receive copies. But I’ve also been working hard on a version of the anthology for sale as a paperback, and on Kindle too! You can buy a copy from wherever you are in the world. All royalties from the sales of the book will go to the Friends of Newholme Hospital, and it will make an excellent gift. All you need to do is to click this link! BUY THE DALES TALES ANTHOLOGY HERE! And if you could review the book on the Amazon site, that would be great. Before Valentine’s Day 2014, we looked at the history of this now rather over-hyped event and read the WH Auden poem ‘O Tell Me the Truth About Love’. Here are our replies! Waiting for your other half to come home. Our own brand of humour. Memories can always bring happiness. At the Regal in Ripley. And we danced through the night. But he was a bit of a lad. Made up his rules and was quite bad! But you always hear about Valentine’s Day. There must be something in this Romance lark! Having a lovely missus is the way. But how to make love – we were in the dark! Or knock a lemonade bottle over their head.